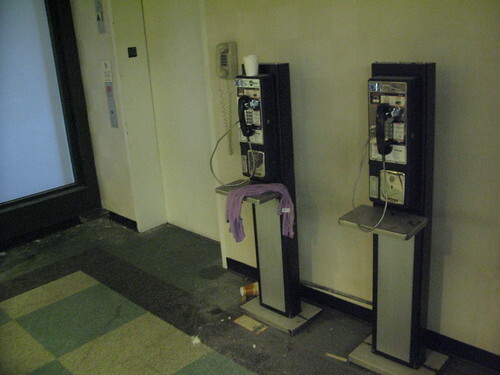 Kind of ironic to put a free house phone right next to a bank of payphones. Also very strange that the phone company (likely New Jersey Bell or later Bell Atlantic) decided to install floor-mounted phones in this location. I would've expected that, given the elevator is right there, they would've been able to mount the phone right to the cinder block wall. Perhaps they didn't because it would've potentially compromised the fire rating of the shaft. Or, perhaps they didn't because they were idiots and they liked wasting materials.